When St. Brigid and St. Patrick had gathered together in prayer for the last time, it is said that St. Patrick was given a vision of Ireland. 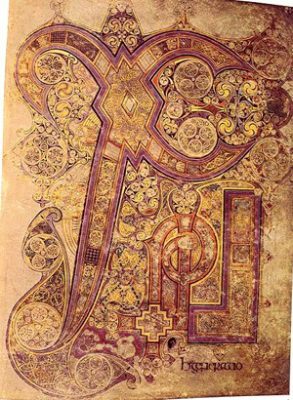 In the vision, he saw all of Ireland illuminated by a great light, the light of Faith. He saw that the light continued to shine on Ireland throughout the centuries and he then learned that the light would never extinguish. It is because these two great saints, St. Patrick and St. Brigid, that this great light continues to shine on Ireland even to this day. St. Brigid was born in Faughart, Ireland around the year 450. Her mother, Brioicsech, was a Christian from Portugal, who had been captured and sold into slavery in Ireland. Her father, Dubhthach, was a pagan chieftain and St. Brigid worked on his farm, herding cattle and sheep. As St. Brigid was already completely detached from the goods of the world, St. Brigid soon sought to quit the world and consecrated herself entirely to God. Unfortunately, though for St. Brigid, since she was very beautiful, she received many offers of marriage. And since her pagan father couldn’t understand her vocation, he ridiculed her for her resolution. 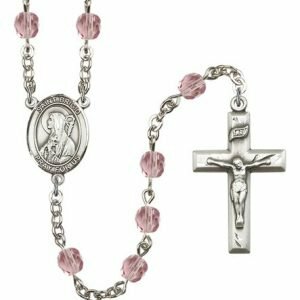 Feeling pressure from her family to marry, St. Brigid then, according to tradition, turned to God in prayer, asking that He take away her beauty, so that no one would want to marry her. Her unusual prayer was heard; St. Brigid lost all of her beauty and she finally was left free to serve the Lord. But as soon as the threat of marriage was removed, St. Brigid’s former beauty was returned to her. At age 15, St. Brigid finally received the veil from St. Marcaille. Together with seven other consecrated virgins, she formed the beginnings of a convent at Croghan Hill. 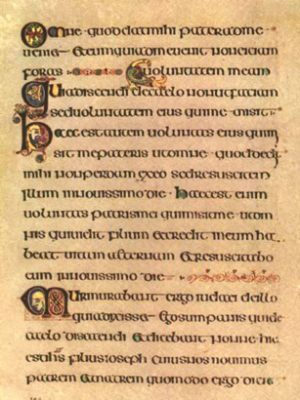 The nuns later settled in Druin Criadh, where in 471, St. Brigid established the famous monastery of Kildare. She was appointed abbess by St. Mel and the monastery was unique in that it was a double monastery (one for men and another for women). The monastery became famous for its artwork, especially for the beautifully illuminated manuscripts and intricate metal work. The monastery at Kildare was the first of many monasteries and churches that St. Brigid would found throughout Ireland. 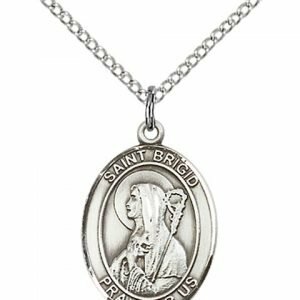 Because of her instrumental work in spreading the Faith in Ireland, St. Brigid has been named co-patroness of the country, along with St. Patrick. On February 1st, 525, St. Brigid died in Kildare, at the age of 75. Her feast day is celebrated on February 1st on, the anniversary of her death. In artwork, St. Brigid is often pictured holding a cross, a burning flame and a book or manuscript. The manuscript represents her great learning and wisdom. The flame refers to the name, Brigid, which means “fiery arrow,” for St. Brigid had been named after the pagan goddess of fire. 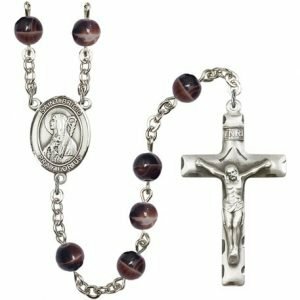 The cross that she holds is commonly called St. Brigid’s Cross and was first made, according to tradition, by the saint herself. 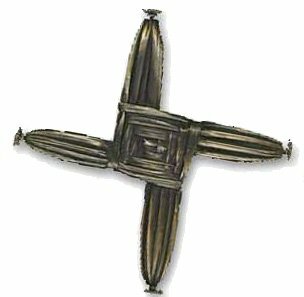 It is said that as a pagan chieftain lay dying, he requested that St. Brigid visit him. By the time St. Brigid had arrived, the chieftain was almost in despair. Quietly, St. Brigid gathered some rushes and skillfully wove them together in the form of a cross. When asked to explain what she was doing, St. Brigid replied, “This is a cross, which I make in honour of the Virgin’s son, who died for us upon a cross of wood.” She then spoke so convincingly about Christ and His saving death on the cross, that the dying man immediately asked to be baptized and died a Christian. Throughout her life, St. Brigid of Ireland (not to be confused with St. Bridget of Sweden), was known for her compassion and charity for others, as well as her extraordinary spirituality. 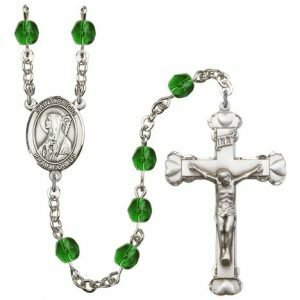 A contemporary of St. Patrick, her devotion to God and desire to do His will was noted from a young age, despite her unusual upbringing. Her example was one of tenderness and love for the poor and underprivileged in Ireland, and she continues to inspire many to carry out these works of mercy today. St. Brigid was born 450 AD in Faughart, Ireland. Her father, Dubhthach, was a pagan chieftain, and her mother, Broicsech, was a Christian. Her mother was born in Portugal, but had been kidnapped by Irish pirates and brought to Ireland to work as a slave. 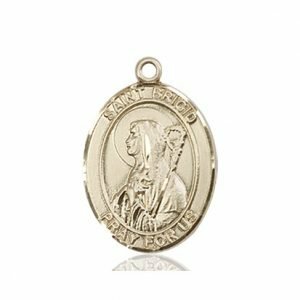 St. Brigid’s father named her after one of the most powerful pagan goddesses – the goddess of fire, thought by the Irish to inspire the flame of knowledge. St. Brigid and her mother were slaves of her father, and while growing up, St. Brigid cooked, cleaned, washed, and fed the animals at her father’s farm. 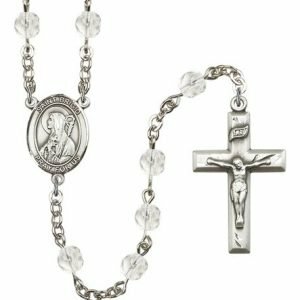 When St. Brigid turned eighteen, she stopped working for her father. She had heard St. Patrick preaching and wanted to work with the sick and poor, living in a way that she called to by God. St. Brigid’s father wanted her to find a husband, but she did not want to get married. It is said that St. Brigid was very beautiful, and prayed to be made ugly so that she would not have to worry about being attractive to men, which would allow for her to devote her life to service. God answered her prayer, and St. Brigid’s beauty faded. She began giving to the poor, which further angered her father. When she gave a jewel-encrusted sword to a poor man so that he could sell it to buy food, her father decided to allow her to enter the convent rather than have her give away his possessions. St. Brigid entered the convent of St. Macaille and made her vows to dedicate her life to God. After making her vows, it is said that St. Brigid’s beauty was not only restored, but that she was made to be even more beautiful than before, as a bride of Christ. News of her good works spread throughout Ireland. Young girls were attracted to her lifestyle and began joining her in religious life and the service of God. St. Brigid founded many convents throughout Ireland. The most famous she founded is in the County Kildare. In 470 she founded a double monastery, which housed monks and nuns. As the abbess of this monastery she had both power and prudence, guiding and leading with wisdom. While establishing a convent in Leinster, St. Brigid went to the king to ask for land on which to build. She told the king of the land she desired, with a forest nearby for firewood, as well as a lake to provide water for growing crops on the land. The king laughed and said no. 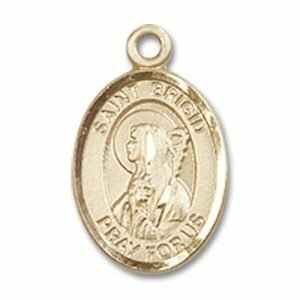 St. Brigid prayed that God would soften the king’s heart. She then asked the king if he would give her at least the amount of land her cloak could cover. The king agreed, seeing how small St. Brigid’s cloak was. St. Brigid gathered four people, one for each corner of her cloak, and asked them to spread it wide over the land. As they spread the cloak, it grew and grew, covering acres of land. The king saw this and realized St. Brigid had been blessed by God. He promised to provide her with money, food, and supplies. Soon after, he was baptized a Christian. St. Brigid also founded an art school where work was done with metal and illumination. The famous Illuminated Manuscripts of Kildare were created in the scriptorium at this facility. These works are highly praised for their beauty, and are considered to be the oldest illuminated manuscripts in Church history. In 525 AD, at the age of 75, St. Brigid died. She was buried in the tomb at the High Altar of the Abbey church she had founded. 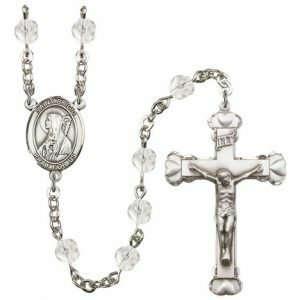 After some time, her remains were exhumed and transferred to rest alongside the two other patron saints of Ireland – St. Patrick and St. Columbkille. Her skull was brought to Lisbon, Portugal, where it remains today. She is known as the “Mary of Ireland,” and her feast day is February 1, which is celebrated as the first day of spring in Ireland. St. Brigid is the patron saint of babies, children whose parents are not married, dairy workers, farmers, Ireland, midwives, nuns, poets, printers, and sailors. St. Brigid is often depicted as an abbess, wearing the habit of a nun and a cloak. Sometimes she is pictured with a cow, which represents her experiences working on her father’s farm. Other times she is holding a cross (known as the St. Brigid’s Cross) with a flame overhead. St. Brigid was named for the pagan goddess of fire; however, the fire within St. Brigid burned with love for the one true God, as shown by the cross in her hands. 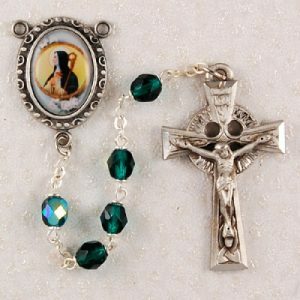 Find St. Brigid medals and rosaries. Available in sterling silver, gold, gold plate and pewter. 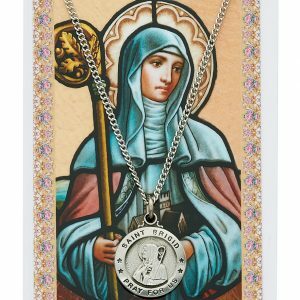 There are even Saint Brigid pendant sets that include a holy card with a St. Brigid prayer on it. O Glorious St. Brigid, Mother of the Churches of Erin, patroness of our missionary race, wherever their lot may be cast, be thou our guide in the paths of virtue, protect us amid temptation, shield us from danger. Preserve to us the heritage of chastity and temperance; keep ever brightly burning on the altar of our hearts the sacred Fire of Faith, Charity, and Hope, that thus we may emulate the ancient piety of Ireland’s children, and the Church of Erin may shine with peerless glory as of old. Thou wert styled by our fathers ” The Mary of Erin,” secure for us by thy prayers the all-powerful protection of the Blessed Virgin, that we may be numbered here among her most fervent clients, and may hereafter merit a place together with Thee and the countless Saints of Ireland, in the ranks of her triumphant children in Paradise. Amen. 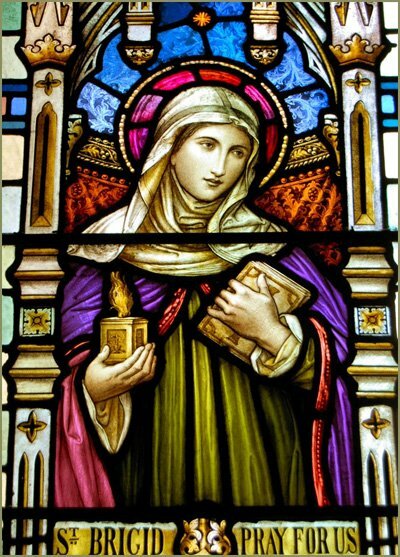 Dear St. Brigid, brilliant star of sanctity in the early days of our Irish faith and love for the omnipotent God Who has never forsaken us, we look up to you now in earnest, hopeful prayer. By your glorious sacrifice of earthly riches, joys and affections obtain for us grace to “seek first the Kingdom of God and His justice” with constant trust in His fatherly care. By your life of laborious charity to the poor, the sick, the many seekers for light and comfort, obtain for us grace to be God’s helpers to the utmost of our power during our stay on earth, looking forward, as you did, to our life with Him during eternity. By the sanctified peace of your death-bed, obtain for us that we may receive the fullness of pardon and peace when the hour comes that will summon us to the judgment seat of our just and most merciful Lord. Amen.